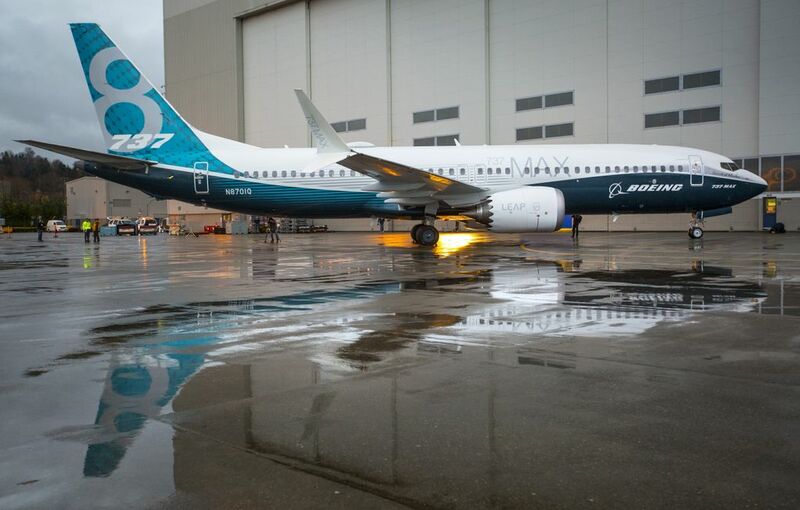 The first Boeing 737 MAX rolled off a spanking-new assembly line in Renton last week, and on Tuesday morning it emerged in a teal-colored livery from the paint hangar for a celebratory unveiling before up to 8,000 first-shift employees. Until this year, the Renton plant housed two highly productive assembly lines, each churning out 21 single-aisle jets per month. In a rabbit-out-of-the-hat transformation, Boeing has now fitted within the same factory space a third assembly line for this new jet – one big enough to accommodate seven 737s nose to tail. “The complexity of this is not so much the changes in the airplane itself, but more about how you weave this new airplane into a factory that’s been producing (the current 737) for 19 years now,” Keith Leverkuhn, vice president of the 737 MAX program, said in an interview Monday. The smooth solving of this manufacturing puzzle is remarkable. Without pausing its breakneck production pace of 42 jets per month, Boeing cleared space for the MAX by consolidating all the subassemblies that feed into the assembly lines and creating a highly automated and efficient fixture for installing the systems inside the empty fuselages that arrive from Spirit AeroSystems in Wichita, Kan. In parallel, Boeing automated its wing manufacturing in an adjacent building to handle further production-rate increases. Yet as the first finished MAX debuted Tuesday, Boeing faces a tough reality: Arriving late to market, its new airplane has already ceded ground to the rival Airbus A320neo family. While the current 737 and A320 models divide the market roughly 50/50, at the end of November Airbus had firm orders for 4,443 neos compared with Boeing’s orders for 2,955 MAXs — a 60/40 market split. Boeing’s MAX sales show no sign of closing that gap. Not only did the neo amass more than 1,000 orders before the MAX launched in December 2011, since then it has won 53 percent market share against the Boeing jet. The MAX flight-test airplane celebrated Tuesday is expected to fly early in the new year. After roughly a year of test flying by a total four test aircraft, the first MAX delivery should go to Southwest Airlines in the third quarter of 2017. Airbus is well ahead, with the first A320neo expected to be delivered by the end of this month. That lag leaves Boeing with “a product strategy problem,” according to Issaquah-based aviation analyst Scott Hamilton. Writing on his Leeham.net website Monday, Hamilton said Airbus’ “commanding market share” means Boeing may be forced to launch a new airplane to replace the MAX as early as 2019 — which would inevitably depress additional MAX sales and so reduce the return on all the investment it’s made in Renton. On Monday, with MAX No. 1 still tucked inside the paint hangar, journalists toured the new assembly line. Mechanics and engineers were busy conducting functional tests on MAX No. 2, which is missing only its new, fuel-efficient LEAP engines made by CFM International. Two workers in the cockpit connected a rugged laptop to the airplane test equipment and through headphones talked to colleagues on the floor who were tending to the jet’s landing gear. As they worked, with the airplane supported on mobile holding equipment, the landing gear swung up into the wheel bay and down again, apparently operating as it should. Inside the jet, seven racks of computers and electronics boxes lined each side of the space that one day will be reconfigured into a passenger cabin. The equipment will be used to gather and analyze every aspect of performance and stress during the upcoming flight tests. Thick bundles of orange wiring, the color that identifies extra wiring installed purely for flight-test purposes, looped everywhere through the racks and along the ceiling and sidewalls of the cabin. On the floor behind MAX No. 2, the wings and horizontal tail parts of No. 3 awaited the arrival of their fuselage. In front of the airplane, the vast floor space was empty as far as the giant exit doors, indicating the scale of Boeing’s housecleaning. Within a year, MAXs should be lined up to fill this space. The third assembly line will allow the production rate in Renton to climb to 52 jets per month in 2018 and possibly past 60 per month by the end of the decade. Leverkuhn said about 1,400 people were working on the MAX at peak during the design phase. That figure is declining as MAX engineering winds down and Boeing switches its engineering focus to the 777X in Everett. For the MAX, the focus is now on production and getting ready to ramp up. Greg Batcher, head of MAX manufacturing, said 241 people currently work on the final-assembly line. About 190 of those are experienced mechanics who have worked producing the current 737 model for years. About 50 are new employees hired for the MAX production line and given six months of training. Those numbers should grow as the third assembly line fills with planes. Leverkuhn said Boeing will build the first airplanes relatively slowly to understand all the intricacies of the new assembly process, then will ramp up quickly. “The first airplane went together very, very well,” he said. “The second one is going together even better. The central innovation on the MAX is the new LEAP engine, which promises to make the jet 14 percent more fuel-efficient than the current 737. The bigger engine also necessitates new engine pods and strengthened wings. – as well as larger flight displays in the cockpit. Among all the high-technology on view Monday, there was one makeshift adaptation on its production line: Workers impaled two tennis balls on the downward-forked spikes of MAX No. 2’s left wingtip, which came close enough to the wall to worry someone about an inadvertent ding. Leverkuhn said he expects all four test airplanes to be flying by mid-2016, and it’s likely Boeing will send one of them to the Farnborough Air Show in England in July. “It will be a great showpiece,” he said.